"Grills" – We carry a wide variety of gas, charcoal, and pellet grills in todays latest styles. 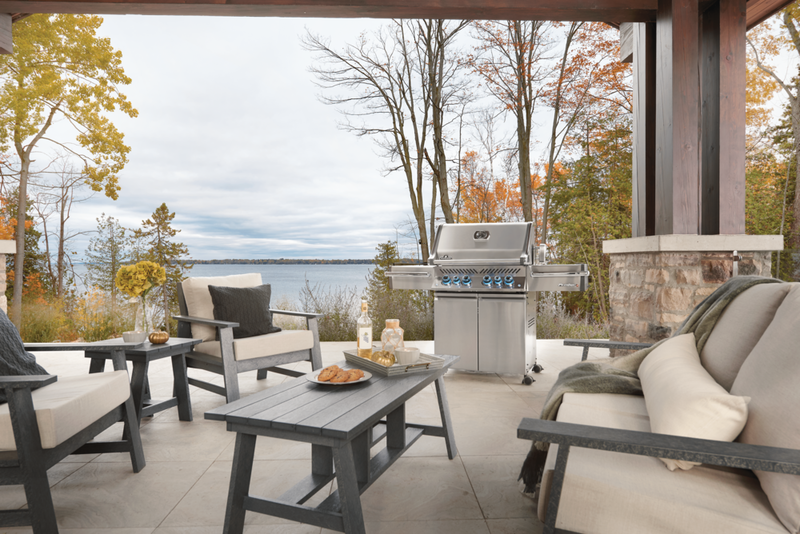 All of our grills are available in natural gas or propane. We also specialize in “Built-In” Grills for any outdoor kitchen project. When you buy a grill from us, you can be confident you are getting a high quality product that will cook the way you would expect and provide many years of enjoyment! "Poly Furniture" – Our line of Poly Furniture from Berlin Gardens, made just South of us in Berlin, Ohio, is one of the most durable types of furniture you can buy. It is made up of 95% recycled materials, mainly out of “Milk Cartons”! It does not fade, can be left outside, and is very sturdy. With many colors and styles available, there is sure to be something for anyone. A Fireplace is the heart of any home. We have been providing our customers with the knowledge and expertise our customers demand for more than 40 years. Feel free to go though out website an contact us with any questions. Pavilions and Pergolas add a complete additional element to your outdoor space. It turns your backyard into a cozy room type atmosphere. An outdoor structure allows you to add a fireplace, outdoor kitchen, dining room set or many other options. Our Berlin ‘Gardens structures are the perfect fit to any backyard. Maintaining your fireplace is essential to keeping your fireplace operating properly. Whether you need service to your gas fireplace or a full camera chimney inspection for your masonry wood burning fireplace, our certified techs will thoroughly go over your fireplace needs. Bring this sheet into our showroom, along with a picture of your fireplace and that will help us select the right product for your fireplace! Click, Print, & SAVE ! ! Click on the coupon offer below to save $100 on your next fireplace purchase! Copyright © 2015 northfieldfireplace.com All Rights Reserved.